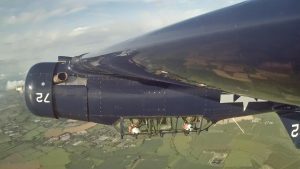 G-TEXN Sporting her new 601 squadron colours for 2018! G-TEXN was built during the Second World War, most probably as an AT-6D Model. 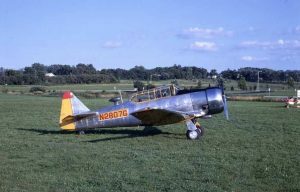 Detailed records are unavailable because, in October 1950, the airframe was among the 1,802 T6’s to be re-manufactured as a T-6G model, bearing the Serial Number 49-3072, and Construction Number 168-176. In the remanufacturing process, the previous identity of the airframe was lost. It was delivered to 3565th Basic Pilot Training Wing (Air Training Command) at James Connelly Air Force Base, Texas. 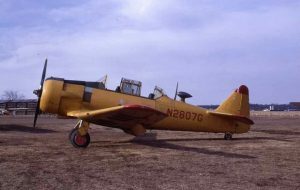 Basic pilot training ceased at Connelly in June 1951. In July of that year, 49-3072 was transferred to the 3303rd Pilot Training Squadron (Air Training Command) at Bartow Air Force Base , Florida, where it remained until August 1956, when it was delivered to the Storage Branch (Air Materiel Command) at Davis-Monthan Air Force Base, Tucson, Arizona. Here, the famous desert ‘boneyards’, with their dry climate and alkali soil, make an ideal location for aircraft storage and preservation. In September 1957, 49-3072 was removed from the US Air Force’s inventory as surplus. 1963 – The aircraft was registered on the American civil register as N2807G in 1963, based in Florida, and owned by Hoyette S. Hudson, a former Tail Gunner on Liberators with the 767th Squadron of the 461st (H) Bomb Group from October 1943. 1976 – N2807G was moved to Chicago in 1965, and then on to Virginia in 1976. 1991 – Moved to Booker, until it was transferred to Thruxton in 1991. 2004 – The aircraft was sold to Northbrook College, Shoreham, for use as an instructional airframe. 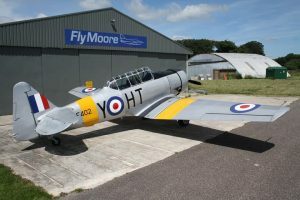 In September 2004, the airframe was purchased by Richard Dauncey and Jon Drake, who undertook the aircraft’s restoration with Apollo Aviation at Shoreham Airport. In June 2005, the aircraft returned to the UK Civil Register as G-TEXN on a Public Transport Category Certificate of Airworthiness.